Incentives and innovation are needed to yield greener cars. His dream has come true. There’s now more than one vehicle for every licensed driver in the United States, and other developed countries are not far behind. 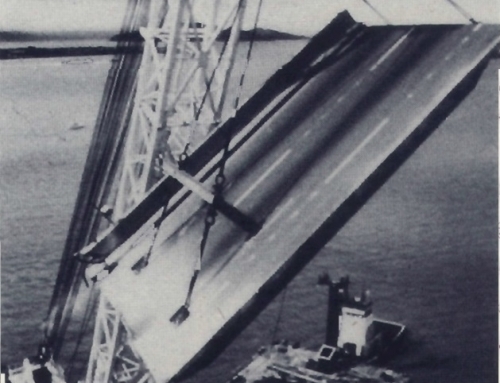 But has the car’s success created the conditions for its own demise? Conventional wisdom of market researchers, consultants, and other experts is that the automobile and its petroleum-powered internal combustion engine will be with us for a long time and that any energy and environmental problems can be readily solved. The automotive industry would very much like to believe that cheery prognosis – and perhaps it’s correct. But suppose it’s not. What if global warming and climate change accelerate? What if people and governments begin to demand and expect even higher environmental quality? And how will the United States and other developed nations respond to growing oil imports? The truth of the matter is that the automotive and energy industries are not prepared – neither in terms of technology nor corporate thinking – for the major changes that are imminent. Just as the American autoindustry underestimated the market threat of Japanese imports 20 years ago, the industry may now be underestimating demands for “greener” and more socially responsible vehicles and fuels. If the industry itself is not responsive, government will undoubtedly intervene, as it has in California. And it boils down not to the survival of the automobile itself, but of the automobile manufacturers. Increased car usage has already created tremendous environmental stresses, along with parallel economic and political problems. Passenger travel, expressed as passenger miles per capita, is rising virtually everywhere, especially in the United States where cars are readily available. As shown in Figure 1, auto travel accounts for 76-86 percent or all domestic travel in virtually every developed country except Japan. But even in Japan, where distances are short, congestion nightmares, and rail transit accessible, autos still account for almost 60 percent of total travel –a figure that continues to rise. 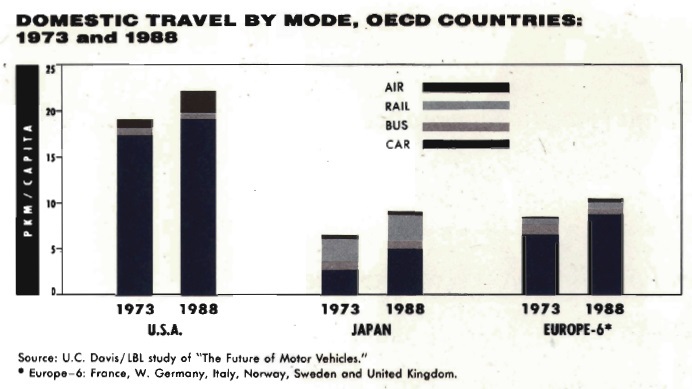 It is simply a myth that public transit is the principal passenger transportation mode in Europe and Japan; in developed countries, auto use is far more prevalent than transit. 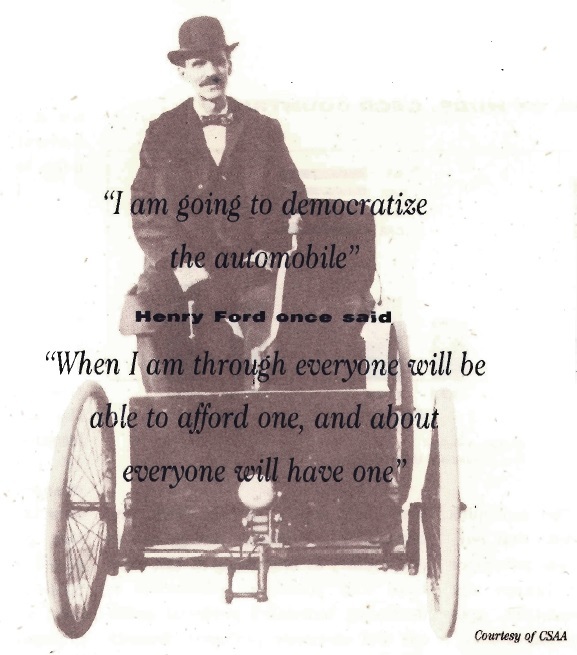 The auto industry benefits from the high value that most people place on the mobility and accessibility offered by motor vehicles, and those people will likely sacrifice much to maintain freedom of movement. But those same people are becoming less tolerant of the growing energy and environmental stresses created by the current transportation system. Tensions are increasing between continuing demand for mobility and the adverse effects or automobile use. Increasing use or gasoline and diesel vehicles will exacerbate problems of petroleum supply. The predicament is not one of inadequate world supply: all signs indicate plentiful amounts of oil will be available at reasonable prices for years to come. The hitch is that for the United States, Europe, and Japan, those plentiful resources lie elsewhere. Virtually all forecasts anticipate a large drop in oil production in the United States and other countries outside the Persian Gulf region in the 1990s and beyond. So automotive energy use in our country is increasing at the same time that petroleum production is declining, indicating potential political and economic problems domestically and internationally. More use of petroleum-powered autos leads to increased emissions of greenhouse gases. Although there has been no definitive proof of global warming, scientists do know that emissions and atmospheric concentrations of greenhouse gases, especially CO2 are rising at a rapid rate. It would be unwise to proceed as if climate change is not a potential problem. We would be grossly irresponsible, not to mention disrespectful of future generations, if we did not attempt to reduce these emissions now. As the Rio conference made clear, civic leaders around the world are demanding policies and actions to forestall further environmental damage, and governments are responding in tum. So what are the remedies? Several possible options for reducing petroleum use and vehicle emissions are at hand – some that involve behavioral changes and some that require technological developments. Behavioral changes range from rethinking government policy to modifying individuals’ conduct. For individuals it means switching from single occupant autos to carpool and transit, and also rearranging job-residence locations. For government it means improving land-use management and regional transportation systems with the aim of reducing numbers and lengths of single-occupant car trips. Of course, substantive behavioral changes are hard to influence and slow to occur. Current research shows that politically palatable strategies aimed at behavioral change are likely to achieve vehicle travel reductions of only a few percent. More sweeping changes may be possible over the long term, but they would require aggressive road pricing and land use management initiatives. Technological fixes appear to be more effective at reducing emissions and petroleum use, in part because they are politically more acceptable. One technological approach to the problems of increased petroleum use and greenhouse gas emissions that promises modest improvement is improved fuel efficiency in automobiles. 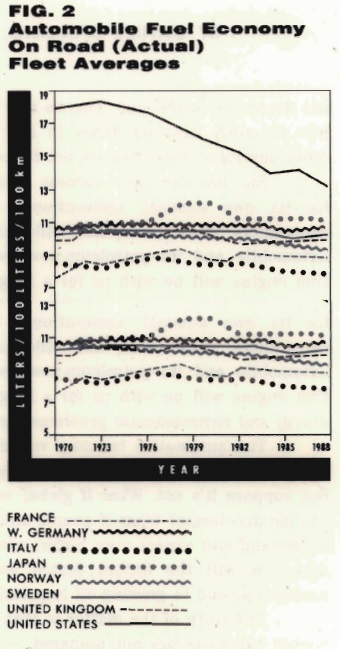 In fact, the fuel efficiency of new cars soared in the United States between the 1973-74 energy crisis and the late 1980s and improved slightly elsewhere. But, as shown in Figure 2, when a country’s entire vehicle fleet is taken together, one finds virtually no improvement over time, except in the U.S. where vehicles were previously huge and heavy. Can fuel efficiency be improved further, and at what cost? The auto industry says new car efficiency could rise by 10-15 percent in the next 15 years, but many environmentalists insist that 40-50 percent improvements are necessary. Studies show that improvements in the range or 15 percent will provide a net economic gain. Upping efficiency beyond that may be socially desirable, but will likely require higher prices and down-sizing. In any case, since the late 1980s, fuel economy has been falling, while per capita car ownership and use continue to rise. The result is increasing use of petroleum by passenger cars, as measured on both per capita and per country bases. Adding in expanding truck and air travel means that total transportation energy use is on a steady upswing. All this tells us that market forces alone won’t result in improved efficiency and reduced oil consumption and that, even with substantial government intervention, it will be difficult to reduce total petroleum consumption. The most promising long-term technical fix for reducing petroleum consumption and environmental threats is 10 substitute alternatively fueled vehicles, especially electric vehicles. 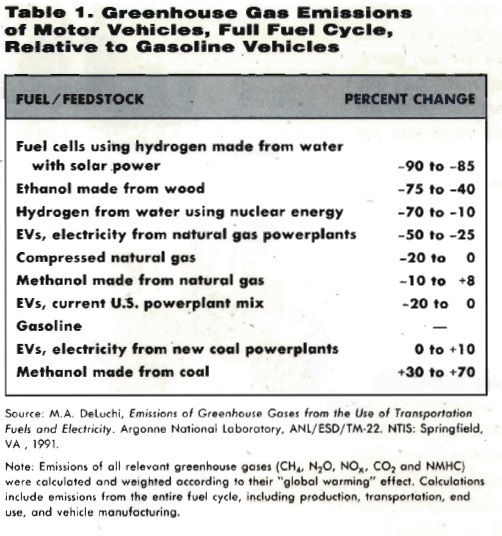 Unfortunately, methanol (made from natural gas) is no better than gasoline in reducing greenhouse gases, and natural gas vehicles are only slightly better, as shown in Table 1. Nevertheless, both offer modest air quality benefits along with replacing petroleum imports. The only way to obtain large reductions in greenhouse gases is to shift to non-fossil fuels – which means creating alcohol fuels from cellulosic biomass, and producing electricity and hydrogen from solar and nuclear sources. The biomass option is promising. The U.S. Department of Energy is now targeting biomass production and conversion as a primary strategy for reducing greenhouse gases from transportation. However, because biomass plantations require large tracts of land, biomass fuels are unlikely ever to be the dominant source of transportation energy in any developed country (except perhaps in sparsely populated Scandinavia and New Zealand). In the long run – which may not be far off – there loom two promising large-scale options. The first is electricity, produced from solar (and perhaps nuclear) sources and used to drive electric cars. The second is hydrogen, separated from water, using solar energy via photovoltaic cells, then burned directly in internal combustion engines or, more likely, in fuel cells. Fuel-cell and solar technologies are immature and expensive. Ultimately, though, as the technologies are improved and the costs are reduced, electricity and hydrogen will likely become the dominant transportation energy sources. If climate change proves to pose a real threat and energy security becomes a high priority, we’ll likely see accelerated development and use of solar-based hydrogen and electricity. As for now, continuing development or electric vehicle (EV) technology, along with modest improvements in vehicle efficiency, are the most sensible options. EVs provide a “least-regrets” and least-cost in preparing for the hydrogen and electricity future. While it’s true that present generation EVs are more expensive, require longer refueling periods, and have limited driving ranges, they also have positive attributes – less maintenance, convenience of home recharging, and quiet operation. More important from a policy perspective, they provide modest greenhouse and huge air-quality benefits in most regions of the world. (See Table 2.) In general, the less coal used for electricity generation, the greater the benefits. But even in the U.S., where 55 percent of electricity is made from coal, electrification of the entire automobile fleet would still result in up to 20 percent reduction in greenhouse gas emissions and substantial reductions in ozone pollution. In most countries, EVs will be a boon to air quality. They eliminate hydrocarbon and carbon monoxide emissions and substantially reduce nitrogen oxides. They do tend to increase sulfur oxide and particulate emissions, but these increases are generally unimportant because cars generate less than 2 percent of those pollutants. Thus even a tripling of sulfur oxide emissions from cars would cause a relatively small overall impact. If introduced on a large scale, EVs would provide much larger air quality benefits than would any other serious option, including any liquid or gaseous fuels. In the long term, as electricity supply shifts to renewable sources, electric vehicles promise almost complete elimination of air pollution and greenhouse gases, as well as almost complete reliance on domestic resources. 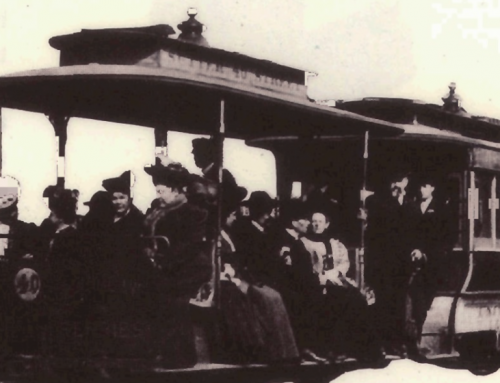 Throughout industrialized countries, then, cars play an increasingly dominant role in passenger transportation, placing great stress on cities, the environment, and political institutions. Politicians and voters will continue to push for stricter environmental and social policing of the auto’s effects. 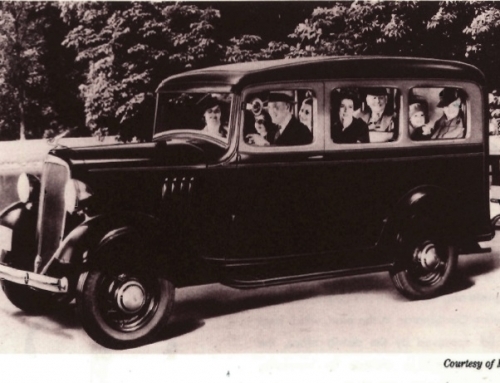 Not a single auto manufacturer has persuasively marketed itself and its vehicles as being socially responsible. Even if one had, who would have noticed? Most car owners – most people – would probably continue to behave as free riders, unwilling to pay extra for environmentally sound cars and fuels even if they do have strong environmental ideals. These same people will, however, vote to force car and fuel suppliers to act more responsibly, to subsidize the expenses associated with reduced environmental pollution. And politicians sense that. 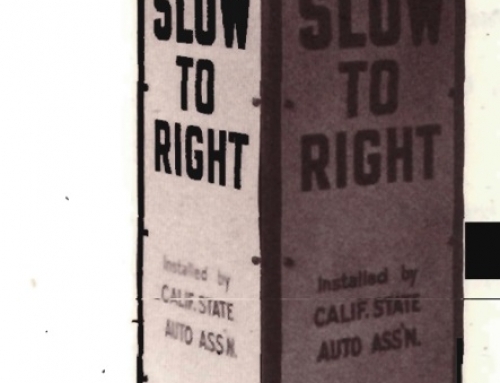 That’s what happened in California, where, in late 1990 and 1991, voters adopted strict regulations on vehicle emissions and the quality of gasolines. The new standards require vehicle manufacturers to reduce emission by up to 80 percent over the next 12 years and require gasoline to be reformulated to reduce hydrocarbon and other emissions by 20-30 percent, at an estimated cost to consumers of about 15 cents per gallon. The state also mandated that all major automakers must begin selling electric or other zero-emission vehicles by 1988. In that year, 2 percent of the cars sold in the state by each manufacturer must be zero-emitting. The percentage increases to 5 percent in 2001 and to 10 percent in 2003 – accounting for about 200,000 cars per year in 2003. The facts regarding automobile use are unambiguous: cars provide accessibility and mobility, and they will likely dominate passenger transportation into the foreseeable future. The challenge is to commercialize a car that is environmentally benign. But that’s not likely to happen without increased governmentally sponsored research aimed at such energy sources as fuel cells, biomass, and solar hydrogen. Nor is it likely to happen without high taxes on high-impact fuels and on gas-guzzling cars – taxes high enough to motivate consumers and industry to turn to those fuels and vehicles. Government must also redesign anti-pollution regulations, making them more flexible and incentive-based. Current regulatory systems are economically inefficient, inappropriate for promoting alternative fuels, and lacking incentives for improvement and innovation. More appropriate incentives and effective regulations will spur the adoption of fuels and vehicles that are sensitive to regional differences and that provide major air quality, greenhouse, and energy-security benefits. Genevieve Giuliano, Kieth Hwang, and Martin Wachs, “Mandating Trip Reductions in Southern California,” UCTC Working Paper, No.98, 1992. 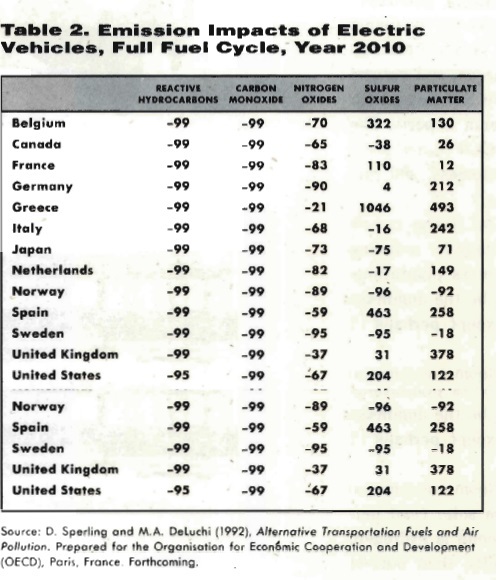 National Research Council, Automotive Fuel Economy, (Washington, D.C.: National Academy Press, 1992.). Office of Technology Assessment, U.S. Congress, Replacing Gasoline, (Washington, D.C.: Government Printing Office, 1991). Quanlu Wang, Mark DeLuchi, and Daniel Sperling, “Emission Impacts of Electric Vehicles.” Journal of Air and Waste Management Association, Vol. 40, pp. 1275-1284. UCTC Reprint, No. 41, 1990. Daniel Sperling, Mark DeLuchi, and Quanlu Wang, Toward Alternative Transportation Fuels and Incentive-Based Regulation of Vehicle Fuels and Emissions. (Berkeley: California Policy Seminar, 1991). M. A. DeLuchi, Emissions of Greenhouse Gases from the Use of Transportation Fuels and Electricity. Argonne National Laboratory, ANL/ESD/TM-22. 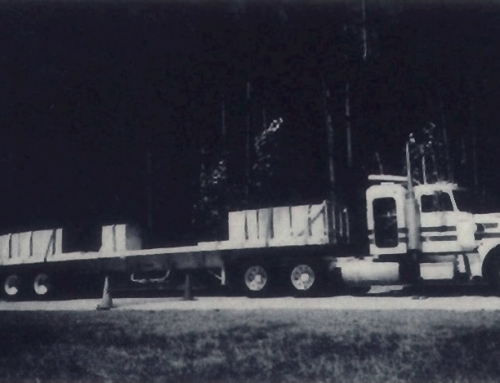 (Springfield, VA.: NTIS, 1991). Thomas Turrentine and Daniel Sperling. 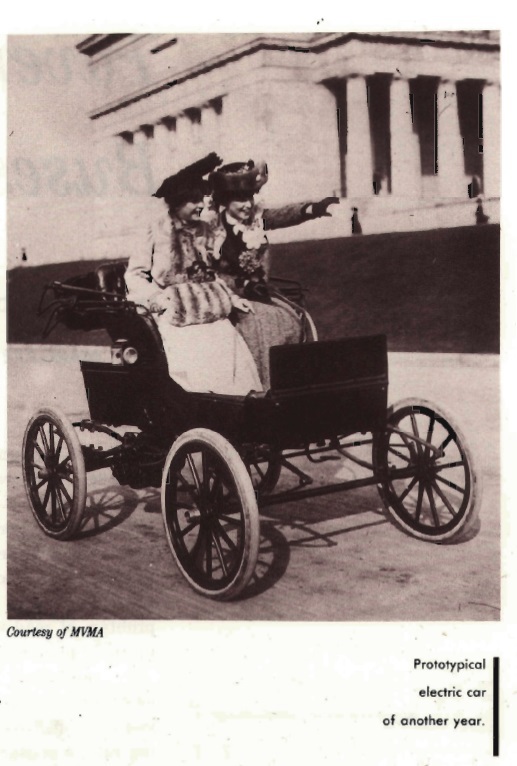 “Is there a Market for a Vehicle With 100 Mile Range?” Proceedings, Urban Electric Vehicle, (Paris: OECD/IEA, 1992). Professor and Director of the Institute of Transportation Studies at the University of California, Davis (dsperling@ucdavis.edu). Lee Schipper is a senior research scientist for the Global Metropolitan Studies Initiative at the University of California, Berkeley (schipper@berkeley.edu). Mark Delucchi is a research scientist at the Institute of Transportation Studies (ITS) at the University of California, Berkeley (madelucchi@ucdavis.edu). Quanlu Wang is a research associate in the Institute of Transportation Studies, University of California, Davis, CA 95616.